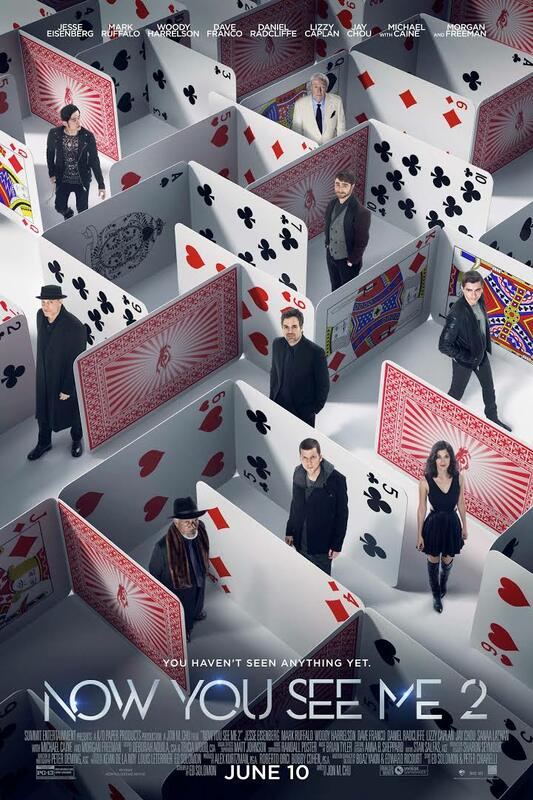 Now You See Me (the first movie) took me and my family by surprise. So we were all pumped to see NYSM2, and after seeing Warcraft (bleh) the day before, we needed something good. And we weren't disappointed. Some have been saying the second one is better than the first...I wouldn't go that far. But it was just as good. I like that they show you how the magic tricks work. It was predictable, if you pay attention, but still a lot of fun. I like all the actors and they had great chemistry together. And for once, I didn't see Harry Potter when Daniel Radcliffe was on screen. My daughter (15) and I agree that Dave Franco is a cutie pie. This one is definitely worth a matinee price and if you loved the first one, worth the full price. Thanks! stop back by and let me know what you thought! Missed them both - is Dave Franco related to James Franco? Totally enjoyed the first movie --- and REALLY relieved that the second one is enjoyable too. I was afraid they might not have anywhere to go. Thanks for the review! Wow! I never saw the first one...don't even know if I even heard of it...will definitely grab the first video and catch up...thx for the review! so my husband just told me we saw the first movie..ha! well, I've been super wrapped up in my world here...so there you have it!